Industrials were weakest for large-cap, and that reflects GE, CAT and other large industrials with captive finance programs and lots of debt. I continue to think that this is one of the worst places to be and would recommend holding only companies with minimal or no debt. The group tends to sell capital equipment, which will be deferred, and it is being hit by currency headwinds, dropping global demand and tight credit all at once. He thinks health care and utilities stocks hold much more promise. Note that since the bear marked kicked into high gear last summer, the S&P 500 has barely budged above the center of its RSI trading range. 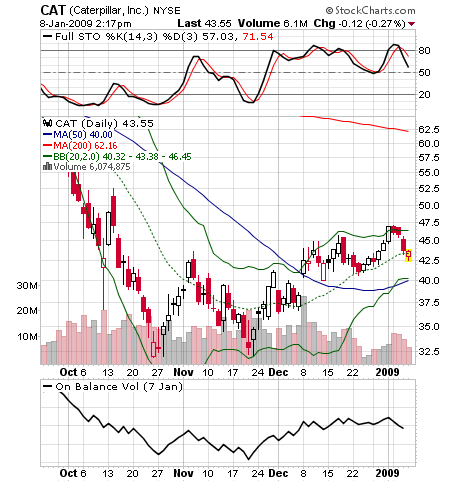 Meanwhile, Caterpillar is at the bottom of its RSI range today. Disclosure: I own no Cat shares. Trust me, it’ll make you stronger in the long run. The 2.6 percent drop was worse than economists had forecast, a Commerce Department report showed today in Washington. Excluding automobiles and aircraft, orders decreased 3.6 percent, also more than anticipated. The Labor Department said separately that the number of Americans collecting jobless benefits soared to a record 4.776 million. Today’s reports reflect efforts by companies from General Motors Corp. to Caterpillar Inc. to downsize amid a pullback in both domestic spending and demand from overseas. The Federal Reserve yesterday warned that a prolonged global downturn may push the U.S. to the brink of deflation. In all, more than 11 million U.S. workers are unemployed, a 48 percent jump from a year ago. The numbers translate to roughly four job seekers for every one job opening in the United States, according to Heidi Shierholz, an economist at the Economic Policy Institute, a Washington-based think tank. The grim job picture cuts across nearly every sector, she said. “There are literally millions of workers unemployed with no hope of finding a new job,” she said. How many other P-town natives remember when that store was called Unclaimed Freight? A collateralised debt obligation is a financial structure that groups individual loans, bonds or assets in a portfolio, which can then be traded. In theory, CDOs attract a stronger credit rating than individual assets due to the risk being more diversified. But as the performance of some assets has fallen, the value of many CDOs have also been reduced. A swap designed to transfer credit risk, in effect a form of financial insurance. The buyer of the swap makes periodic payments to the seller in return for protection in the event of a default on a loan. Leveraging, or gearing, means using debt to supplement investment. The more you borrow on top of the funds (or equity) you already have, the more highly leveraged you are. Leveraging can maximise both gains and losses. Similar to a pyramid scheme, an enterprise where – instead of genuine profits – funds from new investors are used to pay high returns to current investors. Named after the Italian fraudster Charles Ponzi, such schemes are destined to collapse as soon as new investment tails off or significant numbers of investors simultaneously wish to withdraw funds. Debts that are very unlikely to be recovered from borrowers. Most lenders expect that some customers cannot repay; toxic debt describes a whole package of loans where it is now unlikely that it will be repaid. Stochastics show when a stock is “oversold” or “overbought.” Always remember a stock can stay oversold or overbought for far longer than you can stay solvent. Also: stocks can lose a huge chunk of their value going from the top to the bottom of this range, so saying “I’ll just buy when it’s at the bottom of the range and sell at the top” can be very costly because a stock that trades at 80 at the top of its range in October might be only at 60 at the top in November. On-balance volume is a trend-follower’s friend. It’s reasonably safe to be long in a stock while the on-balance volume is positive. Bollinger Bands narrow at trend changes. Whole books have been devoted to these bands; I just know some traders watch them like hawks. 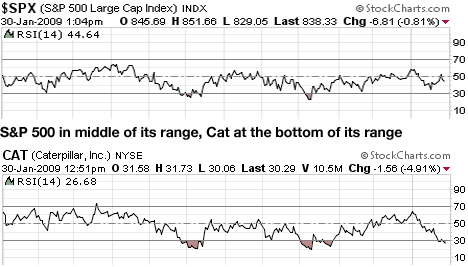 Candlesticks offer clues on trend reversals. Long “tails” can point in the direction of the coming move. StockCharts.com has an excellent Chart School to provide a grounding in what these and other indicators mean.